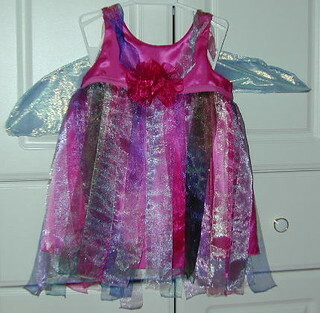 I made this lovely dress for my Isabel’s Halloween costume. She loves pink, and she loves wearing the hot pink slip and shorts, but she refuses to wear the dress. My daughter refused to wear the dress. She likes hot pink and would wear the underdress and shorts, so I decided to rip apart the over dress and put all the ribbons on the underdress. The dress is very easy to sew. 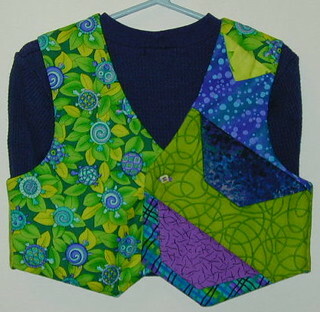 The fabrics that they recommend are more difficult to work with. 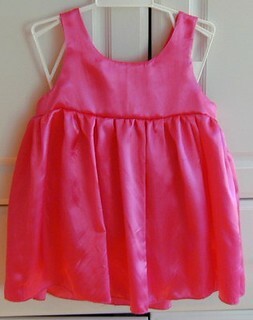 My daughter chose a hot pink acetate satin, which is ravely and slippery, for the underdress and shorts. Because I have a serger, it wasn’t difficult for me to work with, but I wouldn’t want to tackle this fabric on the sewing machine alone. I chose a pale pink, acetate metallic fabric for the overdress. This fabric is just ravelly, and the serger makes it much easier to deal with. 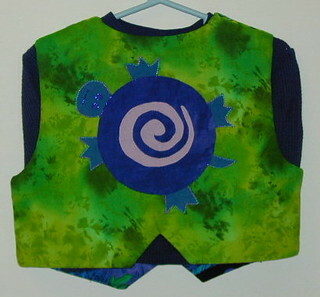 Both fabrics are dry clean only, which is a ridiculous limitation for a child’s costume. 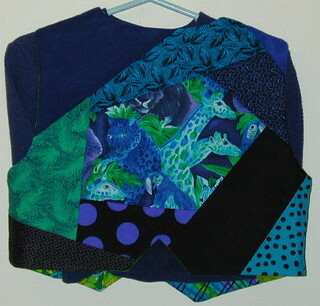 I prewashed in cold and hung dry first 6 inch square samples, then the yardage, with no ill effect. 1. I used regular ribbon instead of wire-edged ribbon. I think wire edged ribbon would be too pokey for a garment. 2. I used snaps for closures instead of hook & eyes. 3. I made the fairywings out of pale blue acetate metallic fabric, instead of paper, using pipecleaners to give the upperwing a little stiffness. 1. I would only make one dress, not a dress and slip. 2. 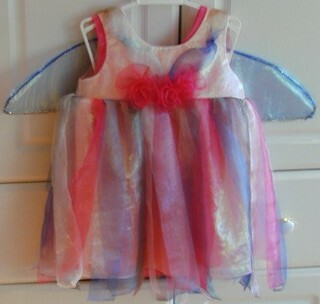 I would make my “ribbons”, probably with tulle, so I don’t have to worry about the long edges fraying. The fabrics for this costume are not expensive, but the ribbons are. 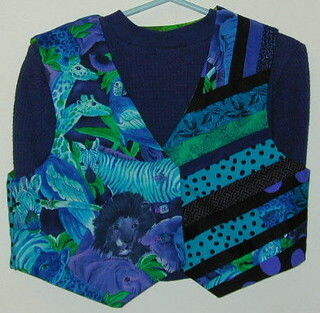 My greatest reservation in recommending this pattern is the expense of the ribbons. If you don’t have an outlet nearby, the ribbons can be a bank breaker. daughter. 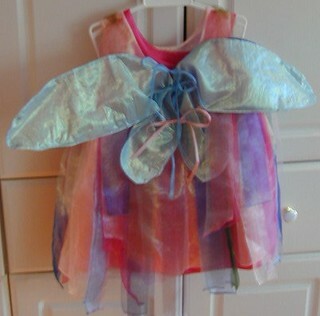 My daughter loves the slip and shorts, but refuses to wear the overdress.She wanted to be a hot pink fairy, and I just didn’t listen. I’m going to remove the ribbons from the overdress and add them to the slip, but it would have been better if I had paid better attention to my 2 year old when we were picking out fabric. In response to the question, “Have I had friends wear the costume to make DD want to wear it?” I suggested this to her, and she thought it was a great idea. In fact, she said she wanted to give the costume to her friend. I ripped apart the overdress, cut the ribbons off of it, and serged the “skirt” ribbons across the top. I didn’t bother to make the skirt width the same as the ungathered skirt. It was wider then the gathered skirt, and that was good enough. By pulling one of the needle threads, I gathered the ribbon skirt until it was about an inch less wide than the underdress gathered width. 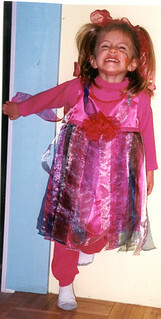 I covered the serged edge of the ribbons with a hot pink bias tape and sewed that down around the waist of the dress. I didn’t want the ribbonsto overlap because I planned on using the bias tape as a tie to close the skirt and tie on the wings. The advantage of this is that the bias tape covered up my crummy gathering job on the underskirt. After that it was a simple task to hand sew the bodice ribbons back on.